You are here: Home / ColaLife Scale-up / More designs on change: What do health and nutrition staff think? It was the first time that rural health centres across some of the most vulnerable and distant areas of Zambia had been supplied with a co-packaged diarrhoea treatment kit, containing both Oral Rehydration Salts and Zinc. An interesting finding, is that the common name for the GRZ ORS/Zinc co-pack within the public sector is ‘Kit Yamoyo’ even though it carries no ‘Kit Yamoyo’ branding. All nine interviewees said they thought Kit Yamoyo was a ‘good product’, a ‘very good product’ or a ‘very, very good product’. 8/9 said that diarrhoea cases had reduced and that the stock position, particularly of zinc, had greatly improved since the distribution of the ORS/Zinc co-pack had started. All interviewees who were asked this question (6) said that co-packaging ensures patients get both ORS and Zinc, and that both ORS and Zinc are now in stock together (because they are co-packaged) and dispensed together. Some mentioned the measuring functionality and the ease of use of the kit. All interviewees (9/9) thought that the co-pack should be on the Zambia Essential Medicines List. This was reported by 3 interviewees, but all reported that this only happened at the outset when the kit was new and all staff were not fully aware of the product and its intended use. All interviewees thought that the co-pack should be distributed with the monthly boxed supply of Health Centre Kits* (as they were during the project) or included inside them. Although not specifically asked, several interviewees thought the ORS/Zinc co-pack should be included in the Logistic Management Information System. ** 8/9 interviewees though that the District Health Office should be able to order the co-packs directly from the government distributor, Medical Stores (MSL), the other thought distribution within the monthly Health Centre Kits was sufficient. * The Health Centre Kits are large boxes of pre-packed essential medicines that are distributed to all health centres. Health centres receive one box per 1,000 people in the catchment of the centre, ideally monthly. ** The Logistic Management Information System allows centres to order specific medicines, in addition to those received via the Health Centre Kits, according to need. All interviewees regarded this as a benefit as it improved access to the recommended diarrhoea treatment and gave people choice. One interviewee said that people who had used the government co-pack were now buying the commercial version in the shops, when previously they saw this format as too expensive. This has positive budgetary implications for the Ministry of Health and indicates that, over time, more people may pay for their own treatment in the same way as they already pay for their own paracetamol, which is available in many large and small shops. All but one of the interviewees (8/9) had used either the government or commercial version of the kit themselves or for a child in their care and had been very happy with it. 6/9 of the interviewees thought that soap should be included in the government co-pack, just as it is in the ‘screw-top’ format of the commercial kit. The Kit Yamoyo Screw-top. This format includes soap as well as ORS and Zinc. The primary concern was that the flow of the government co-pack might stop in the future. One interviewee mentioned the environmental issue associated with the plastic packaging and said for this reason he preferred the ‘screw-top’ commercial format, as this could be re-used. Another interviewee said that he had seen kits with a mismatch of expiry dates on the outer packaging and the individual components (which have their own expiry dates). He found kits which had expired according to the date stamped on the outside of them but the components inside had not expired. 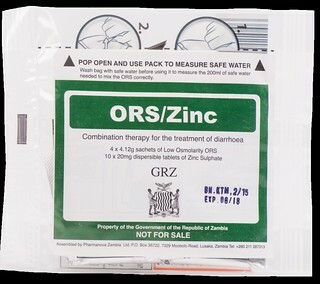 The Ministry of Health should look at all options to ensure that the flow of ORS/Zinc co-packs continues, especially in the SUN (Scaling Up Nutrition) Districts, which are now accustomed to the co-pack and value it greatly as a tool for the management of diarrhoea. The Ministry of Health should consider making the co-pack available nationwide. The Ministry of Health should move to put co-packaged ORS and Zinc on the Zambia Essential Medicines List. Pharmanova (the manufacturers of both ORS/Zinc co-pack formats) should tighten quality control procedures to ensure no mismatch between the expiry dates printed on the outside of the co-pack and the components inside. We wish to thank those who participated in these interviews. Between 13-Dec-17 and 9-Jan-18 structured interviews were conducted with nine health and nutrition professionals working in the public sector to get their views on the government ORS and Zinc co-pack distributed with support from the KYTS-ACE project under the SUN programme. We asked how it had impacted their work. Three worked in Western Province (Mongu District) and six worked in Eastern Province (Chipata and Lundazi districts). The interviews were undertaken as part of the KYTS-ACE Endline Survey. KYTS-ACE supplied 452,000 kits of co-packaged ORS and Zinc to Medical Stores Limited (MSL) through funding from the Scaling Up Nutrition (SUN) programme, funded by DfID, Irish Aid and Swedish government. 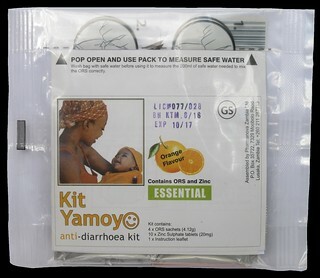 Government-branded ‘Kit Yamoyo’ were distributed to the 14 SUN Districts in Zambia from Jan-16. All interviews were undertaken by project staff and recorded onto Android tablets. The conversations were then transcribed literally and then summarised question by question. The anonymised, question by question summary is available here: colalife.org/wp-content/uploads/2018/04/Partners-Interviews-Questionnaire-SUMMARY-Anon.docx (DOCX, 2.1MB). 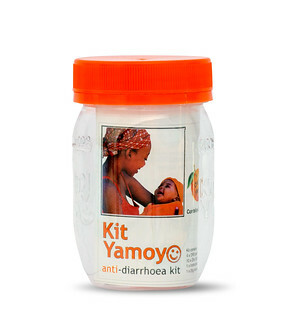 Its a good product I have used it in the management of diarrhea to make ReSoMal in the malnutrition ward.